President Bush isn’t the hateful warmonger people make him out to be. I agree that he’s hurting the United States to an obscene degree (as well as the world as a whole) but it’s not because he’s evil. Allow me to explain. First off we have to decide whether evil lies in the intent or in the outcome. I think it’s a matter of intent. While those who are ignorant may cause just as much suffering as an evil person, as long as they are clueless rather than hateful I think they fail to meet the rather high standard for “evil”. And before you go off on me for implying that Bush is some victim of ignorance and “really a nice guy”, I acknowledge that he’s ultimately at fault for the mistakes he’s made, and that he needs to be held accountable. All I’m saying is that there’s a moral difference between someone misguided committing evil and someone with full understanding of their actions. Bush doesn’t want to be some oil tycoon; he’s not doing any of this for the money. His main goal in life is to be remembered as a hero. He wants to be Ronald Reagan. He wants to go down in history as the man who defeated terrorism and brought peace and democracy to the Middle East. That is the single most important thing to him — his legacy. Everything he’s done in Iraq and elsewhere has been toward the goal of making the world better so that people would love him. His secret fantasy is that of being remembered as a savior, and his most horrible nightmare is being thought of as a bad president. Everything he has done since he’s been in office has been for the purpose of “improving the world” so that people would love him. When he says he wants to bring democracy to Iraq, he’s not lying. Why does he want that? Because he wants to see them be happy. He wants them to celebrate him in the streets. He wants them to remember him as the man who freed them from the old, broken way and showed them the American dream. Sure, there’s no doubt he’s throwing a ton of business to his friends and protecting our oil interests in the region at the same time, but that’s only natural to him. It’s part of the same thing; he doesn’t see any harm in his friends (and the U.S.) benefiting from what will ultimately be positive for the Iraq and the Middle East. The reason he’s so stubborn is because he thinks he’s on one of those humps, like Reagan was with the cold war. I’m sure he tells people, “People thought Reagan was wrong, too…but look what happened! No, sir…I’ll stick to my plan, and when they see how well it turns out they’re going to feel awfully stupid for treating me this way. They’ll know then that I did the right thing…” This is truly what he believes, my friends. He really thinks that if things go his way the world will benefit from it. Unfortunately for Bush (and the world), his perspective of how the world works is catastrophically incorrect. In other words, the one thing that makes Bush a good person is being right about how the world works, and being able to do exactly what he said he could do. And that’s simply not possible. So, hopefully I’ve convinced you that the President’s intentions are not nearly as malicious as they might appear. Surely wanting to save the world and be remembered as a hero ranks far lower on the evil scale than being a man of war who just wants to hurt people. Ironically, however, my assessment for what needs to be done to try and remedy the situation is the same as if I thought he were an evil man. I think Bush should be impeached for being dishonest about a great number of things, as well as simply being ignorant of how the world works and killing tens of thousands of people as a result. I don’t think he should be tried as a criminal; again, he’s not an evil man. Ultimately, his deception came from the will to do the right thing — however misguided that turned out to be. But he must be removed. And most importantly, the next president needs to do something unprecedented: they need to stand up in front of the world and apologize. 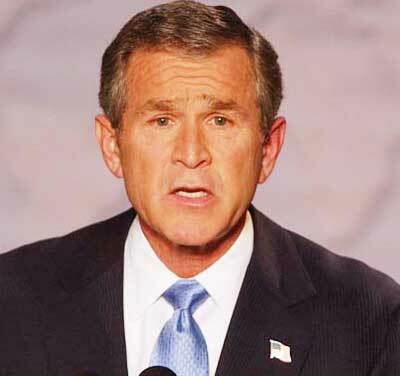 Apologize for what Bush did on behalf of the American people who put him in office. — 1 I’m referring to the expression of hate here — especially religious hate — which is obviously a serious problem in Iraq.